This is a topic we’ve explored on the blog before, and we wanted to expand on it this season! Performing in the recital is a brand new experience for most of our young dancers. And while some will find it exciting, others might be a little nervous. In our experience, one of the keys to recital success is encouraging your child to do their best and reassuring them that you are proud no matter what. So, what’s it going to be like when the big day rolls around? What’s reasonable for you to expect from your child? We’ve put together some of our best advice for a rewarding recital experience with your little one! Dancing on stage in front of hundreds of people is a pretty big deal! Some dancers are shy and others ham it up. However they react, ALL of our young dancers are gaining a tremendous amount of confidence by performing in front of a crowd. Through this process, they are learning about self-expression, managing their emotions, and gaining a sense of accomplishment. Strong emotions might occur, and that’s totally OK! We’ve seen dancers who are so excited to perform they can hardly stand still, and others who suddenly become worried that they can’t see mom and dad way out there in the audience. In our experience, most of these big emotions dissipate after dress rehearsal. But we do have a few special tactics to calm and comfort our littlest performers when needed, so rest assured they are always in good hands! Live performances can be unpredictable—and often in positive ways. But you may wonder whether your little one will forget the dance routine or if they’ll have a case of stage fright. 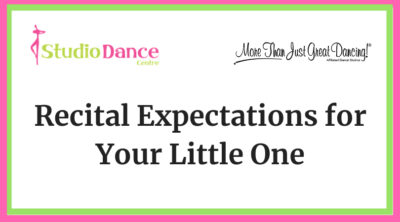 Though those things do happen sometimes, they don’t mean your child’s future in dance is over. (In fact, far from it!) We know we can’t predict exactly what will happen, but we can guarantee that we are as proactive and prepared as possible. Our curricula is designed to focus on gross motor skills and dance fundamentals. Our students are being taught age-appropriate movements that align with their physical development. Don’t expect your little one to perform with the same knowledge and skills of a dancer who is older or more experienced! Technical progress comes over time as each dancer moves through our class levels at just the right pace. Success come in many forms, and we do not promote perfection as one of them! Instead, we talk in class about the dancers trying their best and having fun while they perform. Success is both the child who comes off stage beaming with joy AND the one who shyly admits she enjoyed it; it is both the child who remembered every step AND the one who forgot a few but worked super hard. We want to celebrate every version of recital success! We hope you enjoy watching your dancer onstage at the recital and seeing how far they’ve come this year!